The former first lady will instead focus on "comfort care," a family spokesman said. Former first lady Barbara Bush will not seek additional medical treatment after a series of recent hospitalizations, a family spokesman said Sunday. In a statement, the spokesman said Bush, 92, would instead focus on "comfort care" after consulting with doctors and family members. It wasn't immediately clear what Bush, the wife of former President George H.W. 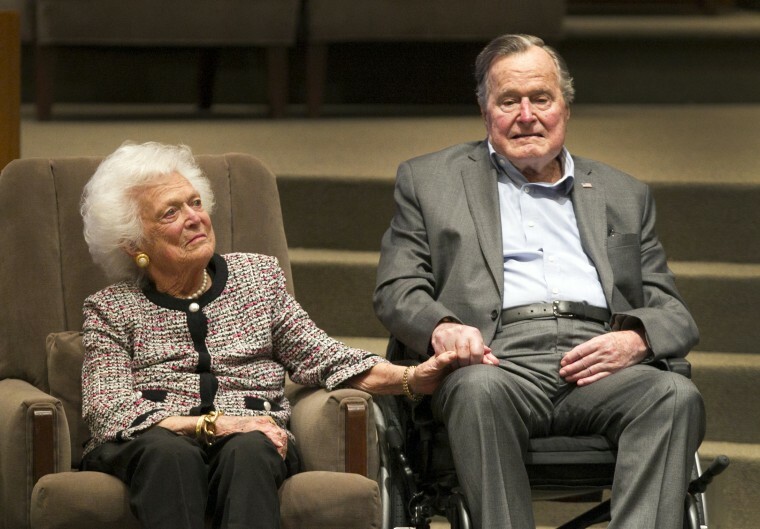 Bush and mother of former President George W. Bush, had been hospitalized for. "It will not surprise those who know her that Barbara Bush has been a rock in the face of her failing health, worrying not for herself — thanks to her abiding faith — but for others," the statement said. "She is surrounded by a family she adores and appreciates the many kind messages and especially the prayers she is receiving." Jenna Bush Hager, daughter of President George W. Bush and Laura Bush, held back tears as she talked about her grandmother's health on the "Today" show, where she is a correspondent, on Monday. "We’re grateful for her and for everybody's prayers and thoughts, and we know the world is better because she’s in it," Bush Hager said. Bush Hager said she spoke to her grandmother on Sunday night and said she is in "great spirits" and surrounded by family. In a statement, the White House said the "President's and First Lady's prayers are with all of the Bush Family during this time." Bush was briefly hospitalized last year for bronchitis. George H.W. Bush, who has a form of Parkinson's disease and has suffered from respiratory difficulties, spent two weeks at Houston Methodist Hospital last year during a bout with pneumonia. The Bushes celebrated their 73rd wedding anniversary earlier this year. They are the longest-married couple in presidential history. First Lady Barbara Bush has touched lives around the world with her faith, grace, and humor. Sending my thoughts to the entire Bush family. My thoughts and prayers are with Mrs. Barbara Bush and the Bush Family. God bless you, Mrs. Bush, and may he hold you in the palm of his hand.